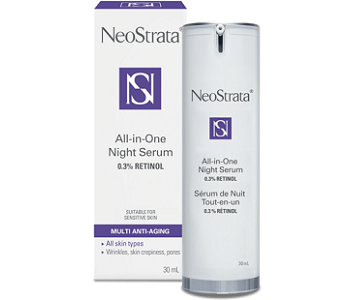 NeoStrata has developed a serum it says delivers clinically proven results in a mere two weeks. The serum in question is All-in-One Night Serum and is where we concentrate our review efforts today. A good night serum can be more nutrient dense than a day serum and can, therefore, be slightly oilier. It should ideally not only slow down aging and restore revitalized skin but actively reverse the signs of aging. NeoStrata says it is suitable for sensitive skin. Hyaluronic Acid contains and retains more moisture than any other compounds by far. New Matrixyl is a pentapeptide that dramatically helps to reduce the visible signs of aging. It is on the Retinol, though, that the manufacturer focuses. It is otherwise known as Vitamin A. It tightens pores and is an anti-inflammatory. As such, it is often used in acne treatments. The manufacturer says it has used pure retinol to minimize irritation (it can dry out and irritate sensitive skin) and to deliver a high concentration to layers of skin deep down. While there is certainly no harm (other than sensitivity) using Vitamin A, the preferred Vitamin in a night serum is E. The latter stimulates collagen production, among other things. The best clinically proven formulations rest on a synthesis of herbal blends to ensure deep absorption and nutrient delivery. Because this serum pivots on three ingredients, it is not a well-rounded one and fails to provide enhanced nourishment. Some major clinically proven ingredients missing are jojoba oil, Alpenrose, and electric daisy flower. Apply every night to your face, neck and décolleté. There is a nozzle through which the product is squeezed out. Use it every other night for the first 14 nights to build up skin tolerance at first. If you need to, follow this up with a moisturizer. Note that due to the presence of Retinol, your skin may become dry and sun-sensitive. The product was not in stock on Amazon. We found the one-ounce bottle retailing online elsewhere for $84. The manufacturer is silent on the issue of returns and a guarantee. This could be because you cannot buy it directly from the manufacturer. However, the lack of a clear policy always tends to find a manufacturer wanting regarding product confidence, even if they claim to be supremely confident in their product. It is risky purchasing an expensive serum that may or may not work, without any refund safety net. There are virtually no consumer reviews but expert reviews by beauty scientists are not positive. Hyaluronic Acid is a good source of hydration and all serums should either include it expressly or include ingredients that stimulate its production. Other than this though, the formula is a bit sparse. It does not tackle the many problems associated with skin from multiple angles. This runs contrary to what one would expect after reading the product claims. The claims are bold, but none of them are backed up by studies or clinical data. If so, the studies or data are not made available, which is strange. It is doubtful that this serum contains the minimum 10% active ingredients required, as there are many filler-type ingredients and ingredients designed to create a silky film, but that accomplish very little. We also do not agree that even sensitive skin types can freely use this serum – when Vitamin A is involved, there are always risks for sensitive skin as it strips skin of its sebum and dries it out. In the process, it greatly increases the skin’s sensitivity to sun exposure. Since there is no seeming guarantee, it is wisest to consider other serum options before using this serum. Bringing you top reviews and product analysis - Consumer Advisors. Consumer Advisors provides detailed reviews about the various health products on the market today. Our goal is to dispense important information to the inquisitive consumer about these products while maintaining an overall factual approach and assessment of what the products are all about.